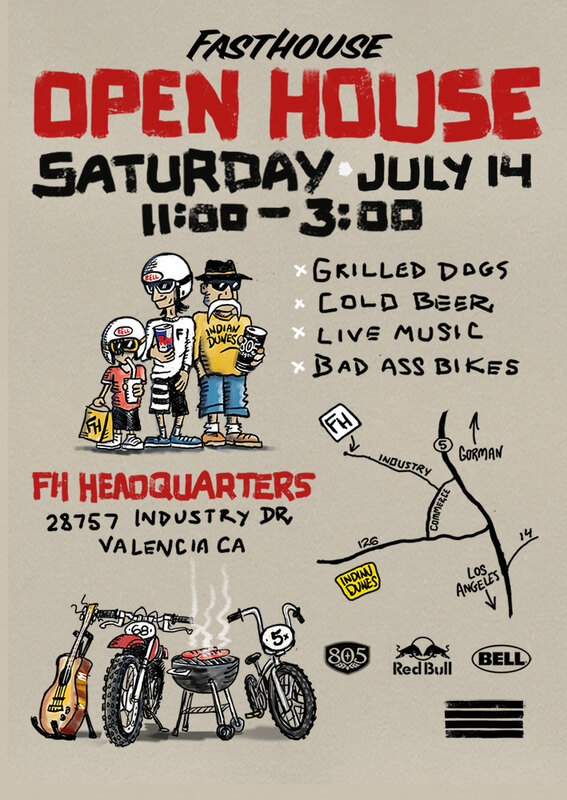 Fasthouse would like to invite you to our Open House on Saturday, July 14th from 11am to 3pm. Fasthouse, as always, is known as “the Purveyor of Good Times” so don’t miss the opportunity to drop in, check out our new home, have a hot dog (as long as they last), a cold brew, and a good time. Enjoy live music and a great display of some badass bikes. Come hang with us, our riders, friends and family representing generations of moto, bmx, and mtb enthusiasts. All kindred spirits welcome. Also celebrating with us are Red Bull, 805 Beer, the Viewing, N-Style, Thrashedkids, Scosche, and Bell. Some of us early risers will be getting in a little morning session, 8am, at Gorman track before the gathering, so if you want to join us it’s $5 per car and a spark arrestor is mandatory. The track will be well prepped.